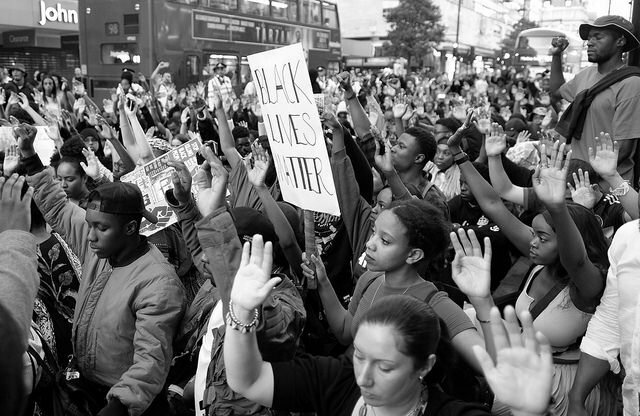 Black Lives Matter protesters kneel and raise their hands in London's Oxford Street - 8 July 2016. Credit: Flickr/Alasdair Hickson. CC BY-NC 2.0. What an offensive against racism looks like. Even though racism is an integral part of American culture, how strongly it is felt and expressed varies on a spectrum, from subtle stereotyping and micro-aggressions on one end to the would-be Kentucky shooter on the other. That means there is always some racial hatred around; we need to just face that. What usually keeps people from violently acting out their hatred is the social context. In the 1960s, bombings of Mississippi black churches became epidemic, along with killings of black people and their white allies — even in broad daylight. Nonviolent civil rights leaders understood this dynamic. King and his comrades were clear that the remedy is to take the offensive, and the movement won gains that, at the time, appeared to be impossible. The economic emphasis of Rustin and A. Philip Randolph also gained support. The 1963 March on Washington — dreaded by President John F. Kennedy and most Democratic Party leaders — significantly named itself the March for Jobs and Freedom, attracting significant trade union support. Three steps help put us back on the offensive.